Katherine Kirk is a third generation Comox Valley native, Katherine's grandparents Geoff & Kath Kirk used to own and live in the Old House Restaurant before it was a restaurant and her grandmother also created the Mile of Flowers which is planted every year by the local Rotary Club. 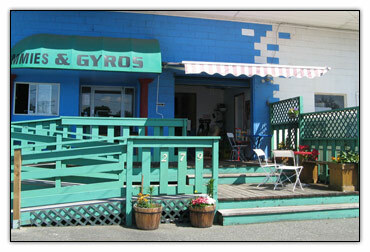 Since Katherine has opened her Gyros Cafe in 1999, informing the public about Gyros has been a continuing project. She has had help from her excellent staff and a few extra part time helpers during the summer and by many many dedicated wonderful customers who frequent the establishment and continually bring in friends and family. The Restaurant business has been challenging for this working single mom but she is proud of her success raising two teenagers and securing her family's future in the Gyros business. Healthy fast food for people on the go and kids love it too!